Parents are happy to help their children with their maths homework and there are several options available to them to purchase any of the Flexitables at affordable prices. If your child is just starting to study maths and you only want a grid then you can buy them without any teaching notes. If your child is more advanced in maths and you want to help either by home tuition or to support their school work then you can buy a grid plus our teaching note booklet. Please note that there is no booklet for the Number grid as there are numerous books already available to use with it. This pack contains 1 each of the 10 x 10 Multiplication, Addition and Fraction grids together with their relevant lesson booklets. 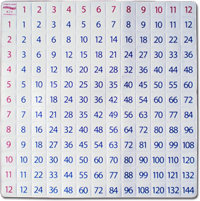 Note: The Home Tuition Kit contains 1 each of the 10 x 10 Multiplication, Addition and Fraction Grids. Download a PDF of the Flexitable Parent Order Form which you can fill out and fax or post.